The 2003 apparition of Mars was a historic one, for at opposition it reached its largest angular diameter in over 50,000yrs. 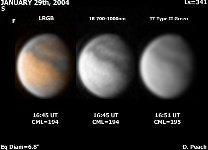 Unfortunatly the Planet was not well placed for northern hemisphere observers due to the opposition period taking place at -15° Declination. Only during post opposition did the Planet become well placed. Mars on January 29th, 2004. Tharsis is now coming into view, while Elysium remians visible toward the morning limb. 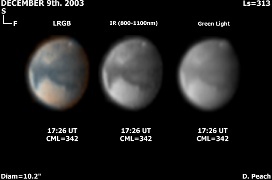 These are the final images of the 2002-04 Mars apparition. 11" Schmidt Cassegrain @ F31. ATK-1HS. South Buckinghamshire, UK. 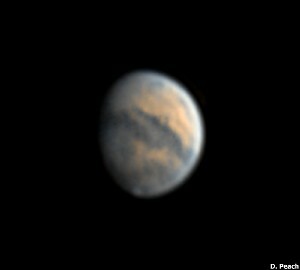 Mars on January 27th, 2004. 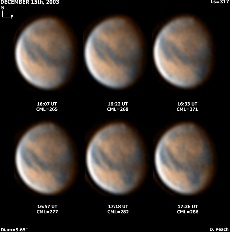 These images show the Elysium region of Mars, and the planet looks normal for the season. Mars on January 24th, 2004. 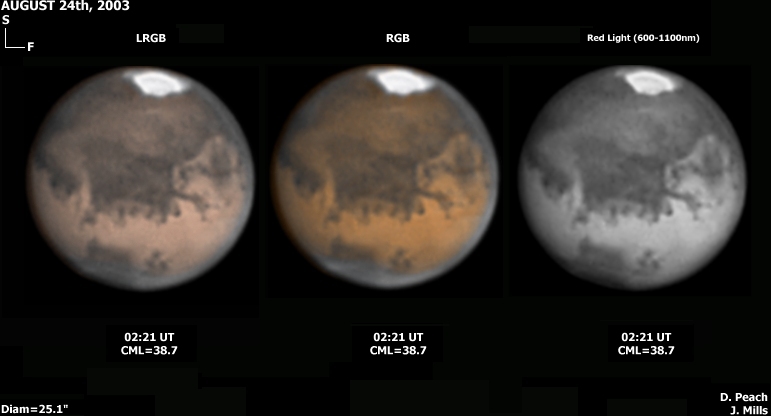 These images again show the Elysium region of Mars, and the planet looks normal. 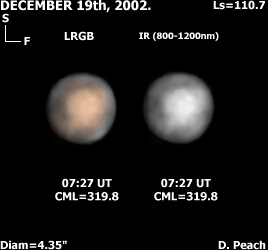 Note the bright limbd haze present, and trivium appears fairly dark. 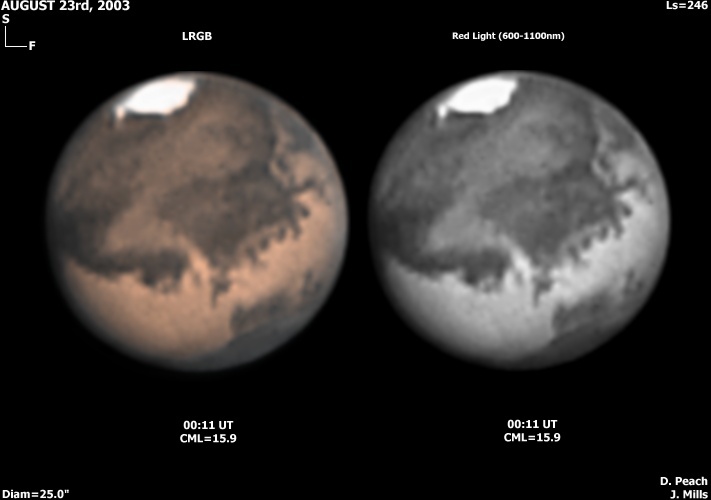 Mars on January 16th, 2004. Three days later from the view below, showing clearly Syrtis Major and Sabeaus Sinus.. Hellas appears clearer, with Zea Lacus visible on its floor. Some bright limb clouds also present. 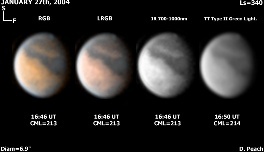 Mars on January 13th, 2004. 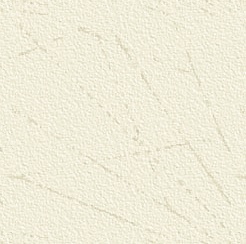 Obtained in fair seeing, showing clearly Sabeaus Sinus, and Hellaspontus. Also the bright Edom crater is seen, and Hellas itself is dusty, with dust spreading toward the SPC. 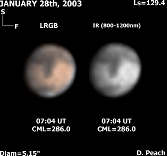 Mars on January 6th, 2004. Part of the Martian South Polar area around Argyre is covered with dust as seen in the first images of 2004.This storm erupted the previous month, and was captured here as it died out. 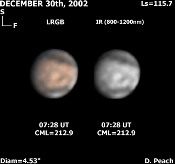 Mars on December 18th, 2003. In this view under excellent conditions, Mare Sirenium is visible, with Elysium close to the lmb. Mars on December 17th, 2003. 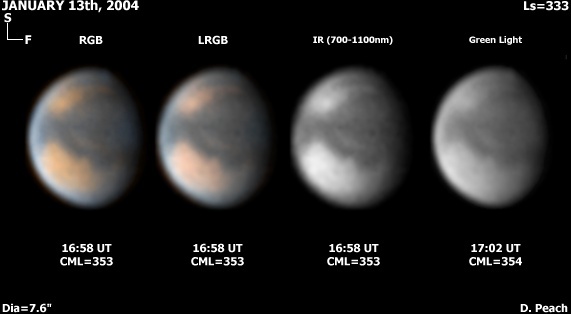 These images reveal Mare Sirenium, and Hesperia. Also a bright evening limb cloud persists. Mars on December 15th, 2003. Now less than 10" arc seconds diameter. the Martian features become harder to resolve in smaller telescopes.These views reveals Syrtis Major, Hellas and a bright evening limb haze. 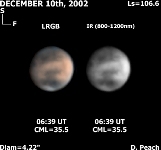 Mars on December 9th, 2003. 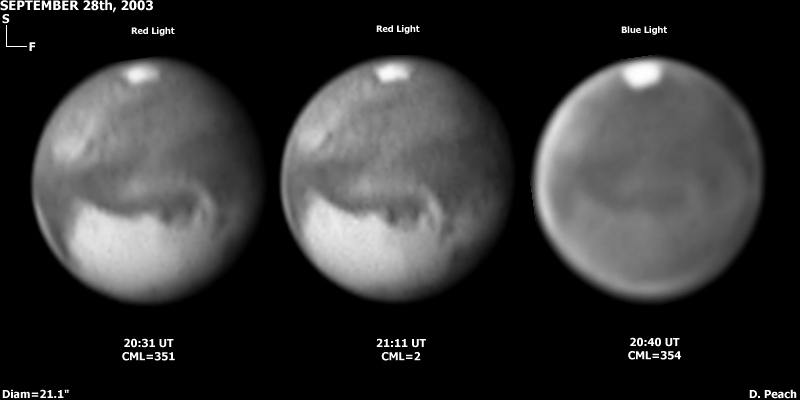 Mars has reduced to 10.18" diameter for these images showing Sabeaus Sinus, Syrtis Major and Hellas. 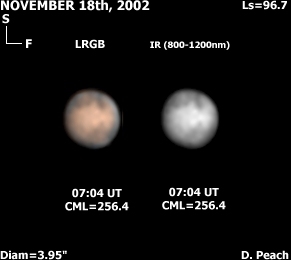 Mars on October 27th, 2003. Now having reduced to 15.6" arc seconds diameter, the Martian disk still remains large enough for much detail to be seen. 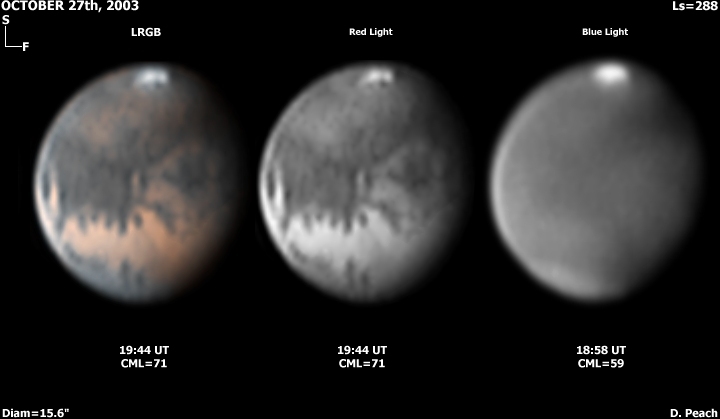 Solis Lacus, and the giant canyon Valles Marineris can be easily seen in these images. Also note the tiny rift across the South Polar cap. 11" Schmidt Cassegrain @ F31. ToUcam Pro. South Buckinghamshire, UK. Mars on October 18th, 2003. The apparent diameter had shrunk to 17" arc seconds for this view, showing Solis Lacus on the limb. 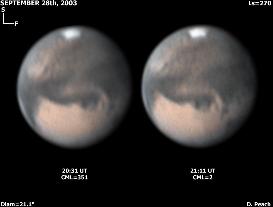 Mars on September 28th, 2003. These views obtained while the Planet was again just 21 degs altitude reveals clearly Sinus Meridiani, Syrtis Major and Hellas. 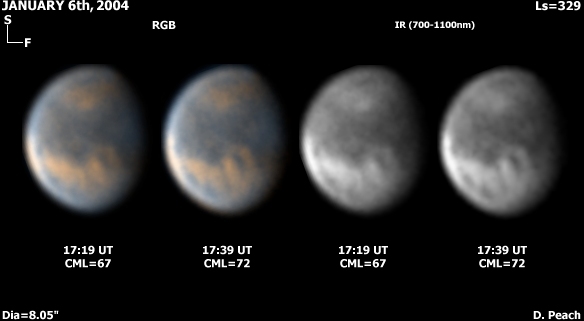 Also note the lack of clouds in the Martian atmosphere in the Blue light image. 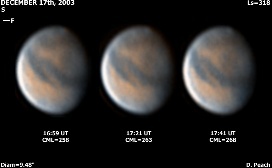 Mars on September 25th, 2003. From the UK the altitude of Mars was much lower. 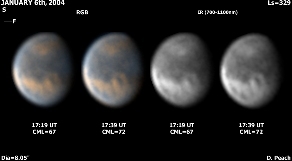 This view from late September when the Planet was just 20 degs altitude shows Sinus Meridiani prominent. Also note the greatly shrunken South Polar Cap. 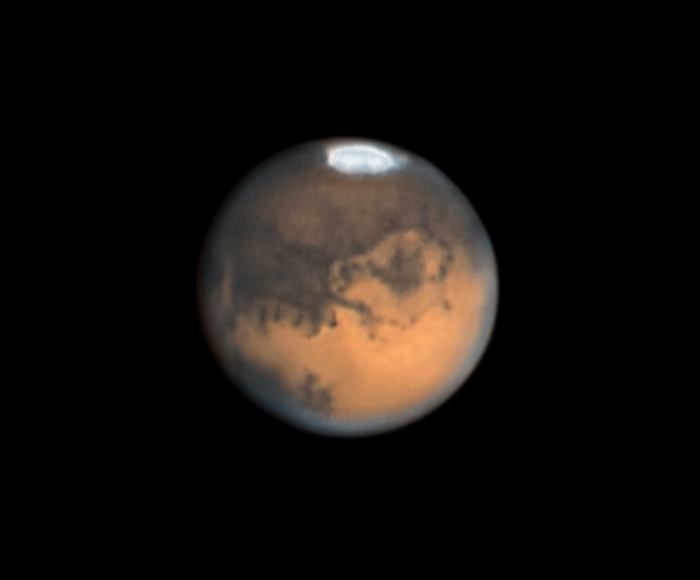 Mars on August 24th, 2003. Just 3 nights from its close approach, and again Chryse and Mare Erythraeum appear on the centre of the disk. 10" Schmidt Cassegrain @ F27.5. ToUcam Pro. Observatory Roque de los Muchachos, La Palma, Canary IsI. Mars on August 23rd, 2003. These images later on the night of the 23rd show Chryse on the meridian. Note the dusky outline of the Argrye impact basin. 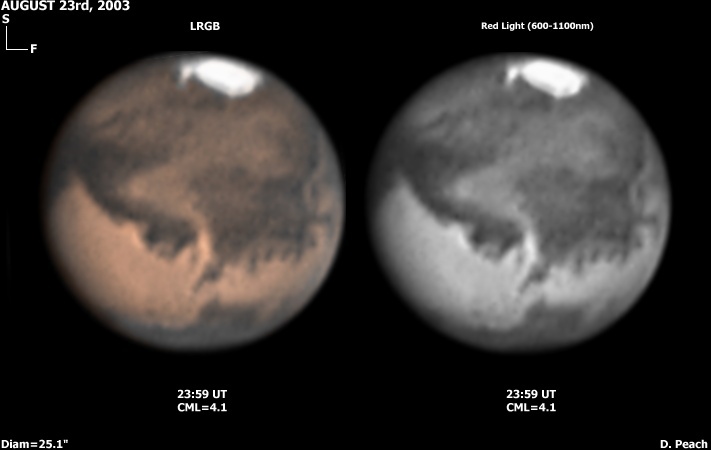 Mars on August 23rd, 2003 (Part 1.) 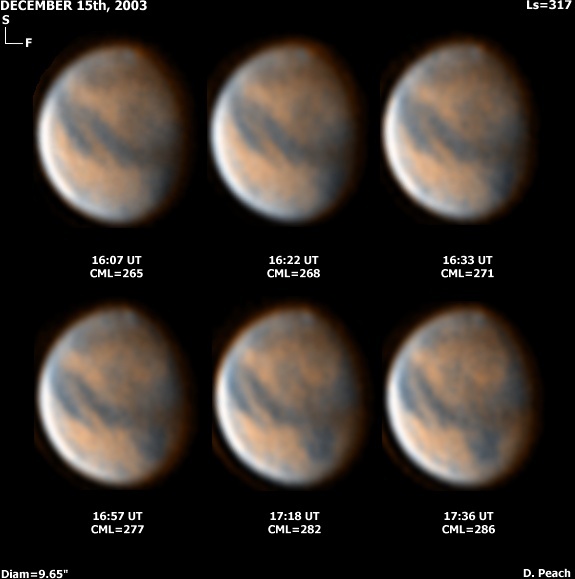 These images reveal many details around Sinus Meridiani, and Chryse. Also note the South Polar cap outlier Novus Mons. Mars on August 22nd, 2003. Just 5 nights away from its closet approach to Earth in 60,000yrs, Mars appears a massive 25" arc seconds in diameter and shines a brilliant magnitude -2.9. These images reveal the intricate detail around Solis Lacus. 10" Schmidt Cassegrain @ F55. ToUcam Pro. Observatory Roque de los Muchachos, La Palma, Canary IsI. 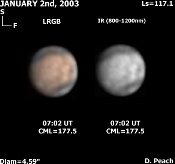 Mars on January 2nd & 28th, 2003. 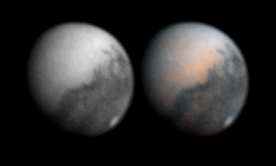 Images at left reveal Tharsis and Elsyium. 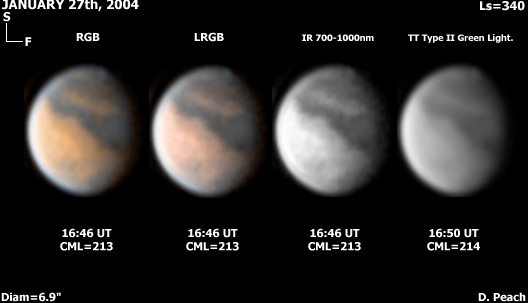 Olympus Mons orographic cloud is seen near the limb. At right Syrtis Major and Hellas appear prominent. 11" Schmidt Cassegrain @ F31. SBIG ST-5c camera. Tenerife, Canary IsI. 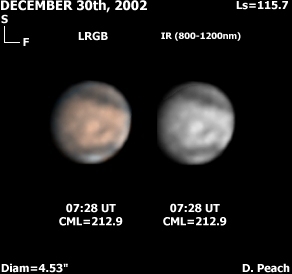 Mars on December 26 & 30th, 2002. 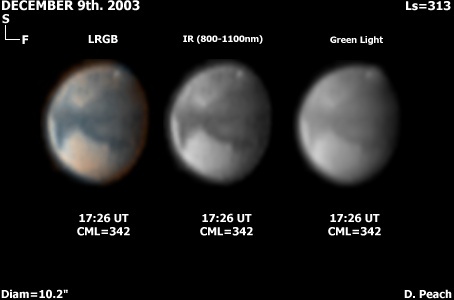 These images clearly reveal a bright Elysium cloud, and the dusky trivium charontis. Mars on December 22nd, 2002. 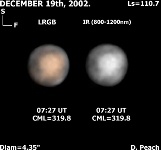 This view from December 2002 shows cleary Syrtis Major and Hellas. 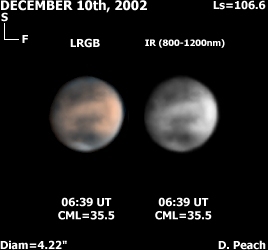 Mars on December 10 & 19th, 2002. The left images clearly show Mare Acidalium and Erythraeum, and Chryse. At right, Sabeaus Sinus and Syrtis Major appear on the disk. 12" Schmidt Cassegrain @ F31. SBIG ST-5c camera. Tenerife, Canary IsI. Mars on November 13th, 2002. 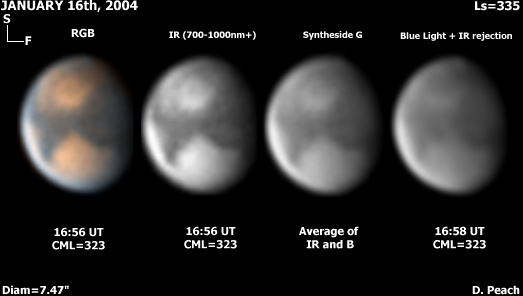 These are some of the earliest Mars images of good resolution ever obtained by an amatuer telescope. 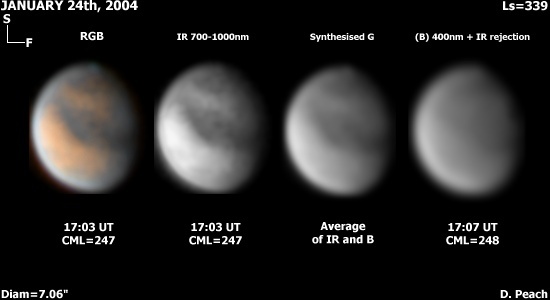 Syrtis Major can clearly be seen, as can Hellas despite the Martian apparent diameter being only 3.9", and 358 million km's distant!.